The Catholic Church in Serbia is part of the worldwide Catholic Church, under the spiritual leadership of the Pope in Rome. There are 356,957 Catholics in Serbia according to the 2011 census, which is roughly 5% of the population. 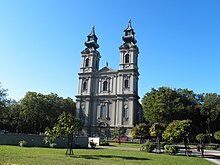 Catholics are mostly concentrated in several municipalities in northern Vojvodina, and are mostly members of ethnic minorities, such as Hungarians and Croats. First official Concordat between the former Kingdom of Serbia and Holy See was concluded on 24 June 1914. By the Second Article of Concordat, it was decided that the regular Archdiocese of Belgrade shall be created. Because of the breakout of First World War, those provisions could not be implemented, and only after the war new arrangements were made. In 1918, Serbia became part of newly formed Kingdom of Yugoslavia. By 1924, the Archdiocese of Belgrade was officially created and first Archbishop appointed. Negotiations on new Concordat between the Kingdom and the Holy See were led by the Yugoslav Minister of Justice Ljudevit Auer and Cardinal Eugenio Pacelli (who later become Pope Pius XII). Concordat was signed in 1935, but it was never officially ratified because of a political crisis in Yugoslavia (1936-1937). Within Serbia, the Latin Rite Catholic hierarchy consists of one archdiocese, three dioceses and one apostolic administration. In addition, the Byzantine Catholic Apostolic Exarchate of Serbia and Montenegro was established in 2002 for Eastern Catholics of the Byzantine Rite in Serbia and Montenegro. In 2013, jurisdiction of the Apostolic Exarchate was reduced to Serbia only. 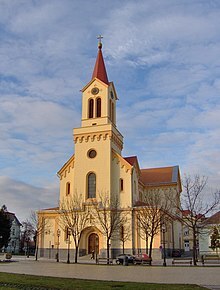 The Diocese of Syrmia is a suffragan of the Archdiocese of Đakovo-Osijek in Croatia. Kosovo is a disputed territory that unilaterally declared independence from Serbia in 2008; since 2000 it is under the Apostolic Administration of Prizren, which also covers some Albanian-populated parts of southern Serbia. The International Bishops' Conference of Saints Cyril and Methodius is the International Catholic Episcopal Conference that includes Serbia, Kosovo, Montenegro and Macedonia. Permanent members are the Catholic bishops and archbishops from the four countries. Two bishops are authorized (Apostolic Exarchate) for jurisdictional districts of the Byzantine rite. As of 2012, the Chairman of the Conference is the Archbishop of Bar Zef Gashi. The conference is a member of the Council of European Bishops' Conferences. ^ Svetlana Radovanović (1995). Demographic Growth and Ethnodemographic Changes in the Republic of Serbia. University of Belgrade. Belgrade: Faculty of Geography. Andrić, Stanko (2016). "Saint John Capistran and Despot George Branković: An Impossible Compromise". Byzantinoslavica. 74 (1–2): 202–227.